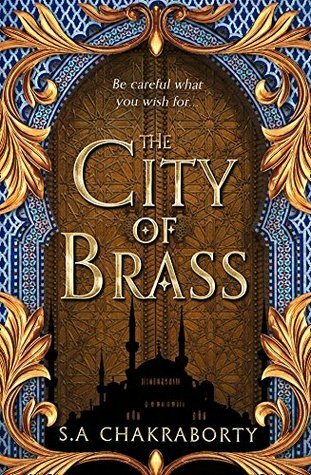 City of Brass is a wonderful debut, and the first book in what I am sure is going to be a phenomenal series! It is lyrical and beautiful, complex and brutal. The Middle Eastern setting had me from the very beginning, but the ongoing world building in this story captured me throughout the entire (lengthy) story. The world building is nothing short of captivating! The lyrical prose along with vivid imagery swept me away into its 500+ pages, and I didn’t want it to end. The storyline is intricate and well thought out. There is political intrigue, magical elements, diverse characters, moral ambiguity and so much more. The story is told via two narrators, Nahri and Ali. The story starts with Nahri, a young girl doing all that she can to survive in 18th Century Cairo. She is a scammer out of necessity, she is smart and she is about to enter a world she never imagined possible. This is where Dara enters the storyline. I won’t go much into how he enters, or his purpose within the story, but even though he is not one of the narrators, Dara is central to the arc of the story. He is multifaceted, mysterious and has a past that slowly unravels throughout the story. His relationship with Nahri is one that I really enjoyed – it is natural and slow, unsure and fits the journey naturally (rather than being forced). Dara was one of the best aspects of this story for me, as I loved his complexity and his navigation throughout this journey. This story is filled with moral differences, political intrigue and those entangled in both. Here is where Ali, our second narrator fits in. A young Daevabad prince of very strong beliefs, he is unapologetic and yet somewhat intriguing. While I didn’t care too much for our young dashing prince, I see the potential for growth in him, and it was this potential that kept me interested in his storyline. One of the things that I loved about this book was the Daevabad. Exploring this magical city through the eyes of the characters was both disturbing and mesmerizing. The beauty and cruelty of this city was openly explored, including the social differences between pure and half djinn. I really respected the fact the ugliness of the social distinction and standing is a major part of the storyline, rather than being pushed aside. The city itself was vividly described and this element of world-building really captures you and pulls you into the heart of the story. The story rides the line of political and personal benefit. Our characters often have to choose between what they believe is best and what they are expected to do. They do make mistakes, they are not perfect, but it is the lessons that they can learn from these mistakes that make it all worthwhile. Will they learn from the past wrongs and the mistakes that are currently occurring – can a better future be found? City of Brass is filled with power and mystery, strategy and allegiances, discrimination and betrayal, hope and justice. It is a wonderful blend of world building and storytelling, morals and action, and magic and realism. The story is a slow burn to begin (as all good fantasy books tend to be) but it soon heats up with political agenda, treachery, past mysteries and moral dilemmas. And there are a few twists in this story that provide far more questions than they do answers! By the end of the book readers are left desperate to find out more. I really find it hard to review books that I love, as I don’t want to just say “I loved it, go buy it”, but I also don’t want to give much away, as I want others to experience the story just as I did. But in short, if you love fantasy, vivid world-building and a lyrical writing style, then is a book for you!